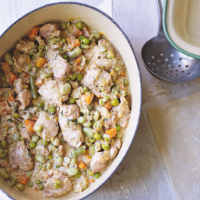 Whip up a large batch of this versatile stew, then freeze the leftovers for another day, or use them as the basis of a delicious pie. 1. Cook the leeks and carrots in a large, heavy-based pan over a medium heat in 1 tbsp oil for 10 minutes, adding the garlic for the last 2 minutes. Remove the vegetables from the pan and set aside. 2. Season the flour, then use it to coat the chicken. Add the remaining oil to the pan and fry the chicken in batches until golden (about 3 minutes on each side). 3. Return the cooked vegetables to the pan, then stir in the pea and bean mix. Pour in the stock, bring to the boil, then simmer until the sauce has thickened (about 5 minutes). 4. Stir in the tarragon, soured cream and mustard. Check the seasoning, then serve half the stew with rice or mash. Once it's cooled, transfer the chicken and vegetable stew to freezer bags, dividing it into suitable portions, then freeze. Defrost overnight in the fridge or use the microwave, following the manufacturer's instructions. Reheat the stew in a large pan over a medium heat until piping hot, adding a little water if the sauce becomes too thick. Spoon the stew into a pie dish and top with ready-rolled puff pastry, then cover with clingfi lm to freeze.Defrost overnight in the fridge, then brush the pastry top with beaten egg and make a couple of slits in the top using a sharp knife. Bake the pie in a preheated oven at 200˚c, gas mark 6 for 40 minutes, or until it's golden and bubbling.